If you’re planning a charcoal wedding then why not purchase your wedding invitations online? 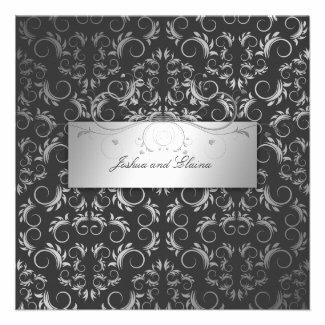 Buying your charcoal wedding invitations online saves you time and money while still being a quality product………at least that’s the case when you purchase any of the invitations on this webpage as the company who makes these invitations (Zazzle) offer a 100% customer satisfaction guarantee. Whether you want all charcoal for your invitations or some fun color combinations like charcoal and aqua or charcoal and orange or even if you want an elegant charcoal and silver or charcoal and cream combination you’re bound to find the perfect invitation on this page so what are you waiting for – let’s go shopping for charcoal wedding invitations! Charcoal’s a great foundation color for weddings creating a very chic and elegant look. When you combine black with charcoal you get a very modern style of wedding, a New York themed wedding or even a vintage Hollywood style of wedding. This combination always seems very elegant and almost timeless which is always great for wedding themes as the photos will (hopefully) be around for years and years to come. Charcoal really compliments yellow as you can see here with these gorgeous wedding invitations (I particularly love the Mason Jar invite). These two colors go together very well resulting in a cool, yet elegant wedding ambiance. Charcoal looks great with the palest of pinks through to the brightest of pinks as you can see from this collection of pink and charcoal wedding invitations – aren’t they gorgeous? From deep purple to pale lavender all hues of purple go really well with charcoal grey as you can see by these wedding invitations. Orange is a very happy color and compliments charcoal grey really well by adding life to the color. This is an awesome, yet little used, wedding color combination that I think could be really memorable if you chose to go with these two colors. Whether you try a paler orange or a deeper shade the combination is really good all year around, although it seems to be the most popular for a fall wedding. Personally I wouldn’t limit yourself to only thinking of this combination for one season of the year. Chartreuse is a shade of green that is making an appearance more and more in weddings and I must say I love it with charcoal – don’t you? Sage is also one of the hot fashion color trends for weddings at the moment and I do think it looks divine with charcoal as well. I have also started to see some gorgeous charcoal and mint wedding invitations which I am falling in love with at the moment, you can check some of them out here – Charcoal and Mint Wedding Invitations. This entry was posted in Uncategorized and tagged charcoal and black wedding invitations, charcoal and blue wedding invitations, charcoal and cream wedding invitations, charcoal and gold wedding invitations, charcoal and green wedding invitations, charcoal and orange wedding invitations, charcoal and pink wedding invitations, charcoal and purple wedding invitations, charcoal and silver wedding invitations, charcoal and yellow wedding invitations, charcoal wedding invitations, wedding invitations on July 28, 2014 by Lou.